Our small ship has negotiated the glittering chain that is Norway's Trondelag archipelago in the Norwegian Sea, threading through myriad islands, islets and skerries to sail into the elongated Trondheimsfjorden. 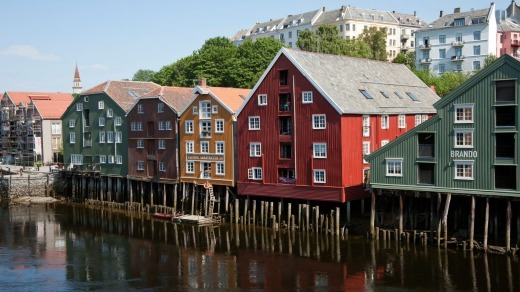 Visions of Norway generally conjure lacy fiord landscapes or Arctic Tundra, but Trondelag, and its capital Trondheim, wedged into the heart of the country, is Norway's quietly achieving region. This is the birthplace of modern Scandinavian democracy – Norway is the world's oldest continuously functioning democracy whose heritage dates back more than 1000 years. Trondheim is the burial place of Norway's patron saint and the first Viking Christian king, St Olav. And it is at St Olav's burial site at Nidaros Cathedral where the St Olav Ways, the Nordic countries' most significant pilgrimage site, concludes. Would-be pilgrims will be delighted to learn that Trondelag is also Norway's primary foodie region. The mild, humid coastal areas rising to the dry, cold plateaux and mountains yield a cornucopia of organic produce. The region is alive with Norway lobsters, Hitra crabs, Froya scallops, salmon and blue mussels to mushroom-munching free-range pork, wild sheep, organic beef and milk, "grotteost" (cave cheese) and spectacular berries, game, local craft beer and aquavit made from local caraway and other herbs. We've come here as part of APT's Majestic Norwegian fiords journey from Tromso to Copenhagen aboard the MS Island Sky. 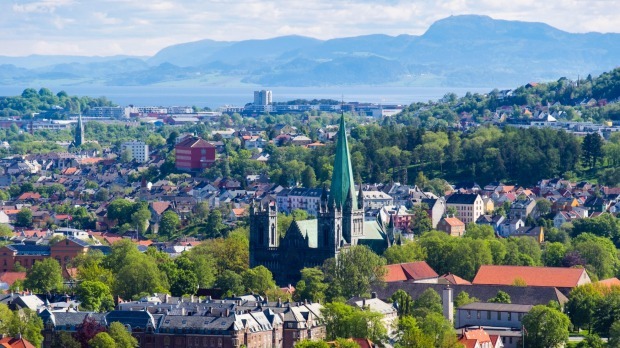 Our six-kilometre guided walk from the dock into the handsome town of Trondheim introduces us to "the city in the middle's" 1000-year-old history, depositing us at Nidaros Cathedral where we are able to contemplate at leisure St Olav's achievements. We are also able to escape the rain in the world's northernmost Gothic cathedral's visitor centre cafe with a decadent Norwegian sjokoladekake (choccie cake) and flat white. St Olav's shrine in Trondheim's Nidaros Cathedral subsequently became the most important destination for medieval Nordic pilgrims. Nidaros was the former name of Trondheim and was the Norwegian capital for much of the Viking era. Signposting of the paths started in 1994 and more than 5000 kilometres have now been marked with the St Olav's cross logo – look out for the cathedral's 0-kilometre stone marker. St Olav's Ways is a European Cultural Route. In summer, there's an evening pilgrim service and pilgrims who've completed the last 100 kilometres can claim the St Olav's letter. Trondheim has an annual St Olav's Festival. The Gothic cathedral's western front is spectacularly carved, though only five of the medieval statues survive. The western facade's stained-glass rose window is early 20th century. It's dark inside but there's some nice Gothic and Romanesque architecture, the shrine, two altars, medieval chapter house and crypt containing marble gravestones. In summer, you can climb the 172-step tower. A combined ticket includes the adjacent 12th-century Archbishop's Palace – one of Europe's best-preserved buildings of its type. Trondelag is a happy region peopled by a type of Norwegian known as "the friendly Tronder". They describe themselves as complex, inventive, courageous, adventurous, peaceful, rounded, hospitable and selfless.